If you need teeth whitened, straightened or are in need of a full mouth restoration, our caring cosmetic dentists at Carson & Carson, DDS take great pride in using only the finest dental materials to help restore your smile. Get a stunning new smile with just one appointment to our cutting-edge dental practices in Oxnard or Camarillo. Visit an Oxnard dentist with over 45 years of experience in Cosmetic Dentistry at Carson & Carson, DDS. Veneers & Lumineers – A veneer is a prosthetic device, usually made of porcelain, that covers the front surface of a tooth (or multiple teeth), blocking cracks or discolorations and help close gaps between teeth. To prepare a tooth for the veneer, we remove a small part of the enamel of the tooth and create an impression, which we use to create the veneer. We will then place the veneer over the tooth, trim the veneer to so that it is a perfect fit and then seal the veneer over the tooth. Once done, you will be left with a stain resistant veneer that gives off a natural appearance. Teeth Whitening – Teeth can become discolored over time through many activities like consuming coffee or colas, smoking, recent dental surgery, or natural as we age. If you want to bring back a whiter smile, the teeth whitening procedure offered at Carson & Carson is a long lasting, painless process. The procedure is straightforward and can be done in only one office visit. We apply a shield that guards your gums and then apply a whitening gel in and around the teeth, followed by a bleaching agent that whitens the teeth. Based on the severity and cause of the stain, the types of bleaching used may change. We adapt our process to get the best results. Teeth Straightening – If you have teeth that are overcrowded, or misaligned, teeth straightening helps correct these issues and gives you a straight smile. There are multiple options for teeth straightening, including braces or invisalign. These are special devices tailored specifically to your mouth and improve tooth alignment over time. To get an idea of the right straightening solution for your situation, please contact the Oxnard dentists of Carson & Carson and request an appointment. 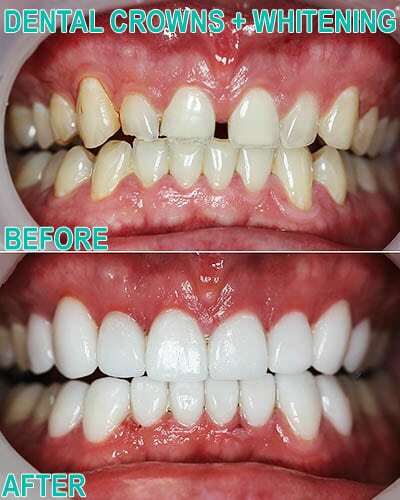 Smile Makeover (Full Mouth Restoration) – A full mouth restoration, also commonly called a smile makeover, is a potent combination of dental and orthopedic procedures. A smile design treatment plan can include the installation of veneers, teeth whitening, gum re-contouring, and may involve oral surgery procedures such as root canals, dental implants or other restorative dental treatments, where necessary, to restore the natural look & function of the teeth. If you think your teeth are ready for a smile makeover, you need a dentist that you can trust to be honest and fair with you. Your teeth deserve care from the best dentists in all of Ventura county. At the Oxnard dental practice of Carson & Carson, our cosmetic dentists have over 60 combined years of experience in restorative and cosmetic dentistry. Make an appointment today and start down the path towards a cleaner, brighter smile for tomorrow! Anterior Bridge before & after. Full porcelain case before & after. Our patient was unhappy with his smile due to deep decay and several fractured teeth. 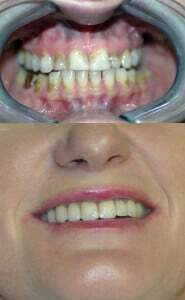 We ended up using all porcelain metal free pressed crowns to acheive a natural shape, smile line, lighter color and gingival health. 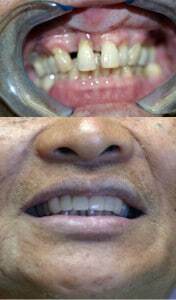 These photos were taken on the same day as cementation. We were able to maintain excellent gingival health throughout the entire process which is just as important as cosmetic design.